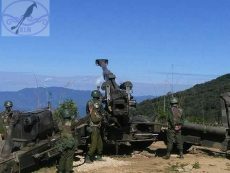 A battle took place between KIA’s 8th Battalion troops and a BA infantry unit near Nam Hu village in Kutkai township on Oct 13 at 10 am. No casualties have been reported from either side. Two women out of 5 Nawng Pa villagers who were detained by BA’s 99th LID troops have been released on Oct 12. But whereabouts of remaining 3 villagers are still unknown.